When I lived in New York, one of my favorite things to do on Sunday was go to the Metropolitan Museum of Art. I would grab a snack and go sit with the paintings. I am definitely not an art connoisseur by ANY means, but there is just something so captivating in a great painting. 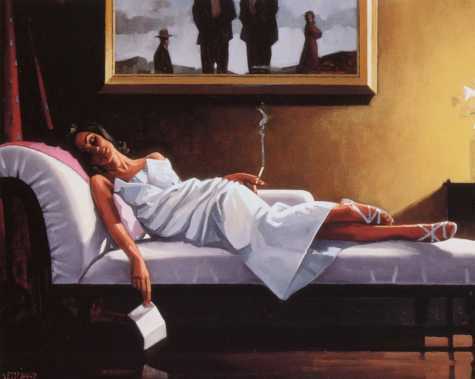 My favorite artist, although more modern than most, is Jack Vettriano. I LOVE IT…CAN”T GET ENOUGH OF IT. His most well known and referential painting is “The Singing Butler”. There is a whole other story going on through the window, but she remains transfixed. That must be one hell of a letter if she needed a cigarette afterwords :). The reality in his work is what really inspires me. Almost like photography, he captures a moment in time, then colors it. That painting “The Letter” totally reminds me of you Rand!! I miss you so much! We need to catch up so bad. You should come to Cabo with Claudia for my 30th this year, how fun would that be!!? ?